The chu-tora female Kai Ken I'm watching has this thing where she can't decide which spot is to her liking to sleep in. She gets up, walks to another spot and plops down. She does this repeatedly until she is satisfied. Earlier this evening when she was doing this I let out a laugh and immediately she jumped up from her sleeping position as to let me know she knew I was laughing at her lol. I was able to capture one of her plops on video. 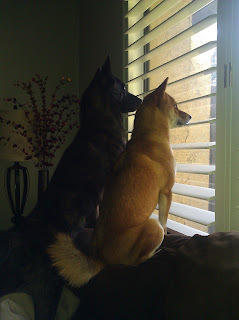 Kyuubi and Mika are little watch dogs. =) They constantly perch themselves at the end of the couch and stare out through the blinds, watching what's going on outside. Sometimes they take turns and sometimes they watch together. Disclaimer: I have never trained my dogs to be any type of watch dog, they do this on their own. A watch dog does not mean that they are a guard dog. There is a difference between a watch dog and a guard dog. 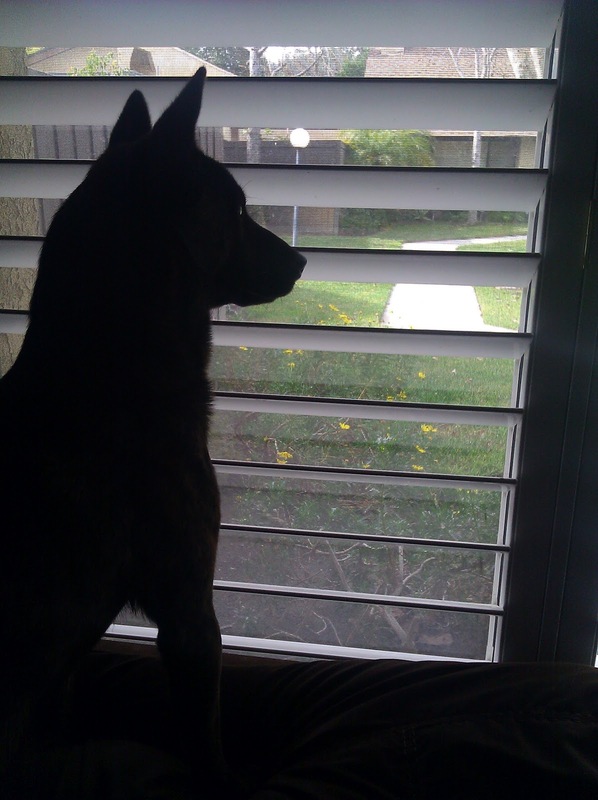 Brad Anderson blogged about the difference between a guard dog and watchdog. It can be read here. So what exactly is R-T-C-SG? Well that's the abbreviation that Simon from Creston Valley Meats uses on one of his new mixed Raw Dog Foods that he offers. It stands for Rabbit, Tripe, Chicken, and Stomach Grass. He started getting an abundance of rabbits and wanted to lower the cost with rabbit mixes for his raw feeding customers so had sent out an e-mail asking us what we would like to see it mixed with. He usually sells whole rabbits for a little bit under $2.00/lb and cleaned rabbit in patty form for about $4.00/lb. He made the mixture so that it would be easy on our pockets. Not only was the price for R-T-C-SG a selling point for me, which was $1.65/lb, but it was also the fact that they came in patty form! Each patty is around 5 oz, and well if things are in patty form it makes portioning the food for the day much easier! I have gotten stuff from Creston in the past where it was just in a gallon zip lock bag and I had to just estimate how much each scoop was that I was taking out of the bag. It was also a lot messier in a regular zip lock bag. The convenience of the patty form definitely sealed the deal for me. R-T-C-SG comes with four patties per pack, and about 9 packs per box. For Mika this would last her about 6.5 weeks. However, she doesn't get this everyday. 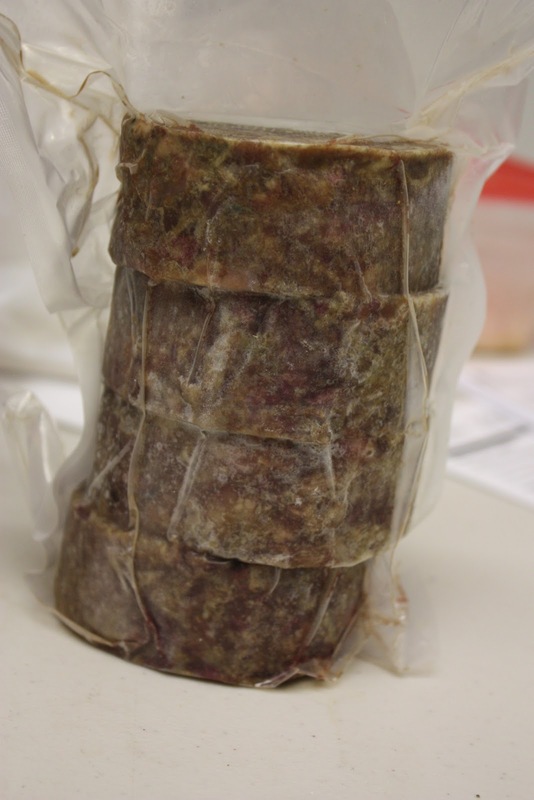 Although not listed there is a big of organ mix in there, I only recognize it because I've gotten the organ mix before and there are parts of livers and kidneys in there very visible, especially since it is full rabbit and chicken mixed in. The organ content in R-T-C-SG is a bit too much for Mika to be eating this everyday, so that's why she gets once a week and it's usually following or will be followed up with a bone-in meal. While everything raw has bit of an odor to it, I like this mixture better. It does have tripe in it which is awesome for the dogs, and it doesn't have the disgusting smell that tripe gives off on it's own. I'm not going to say that this smells good, because heck, what raw food smells good? But the smell is tolerable compared to tripe! Hopefully we will see these back up on Creston Valley to make another purchase. 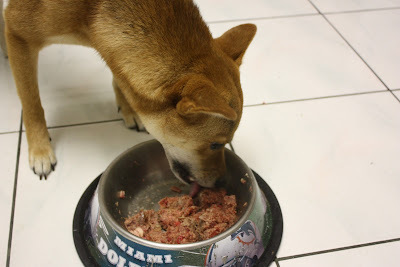 Mika loved it, and I'm sure Kyuubi will love it too when he's put on a 100% raw diet. 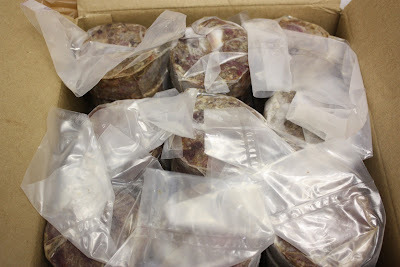 I finally opened the box of ostrich tails that I purchased from Creston Valley Meats. 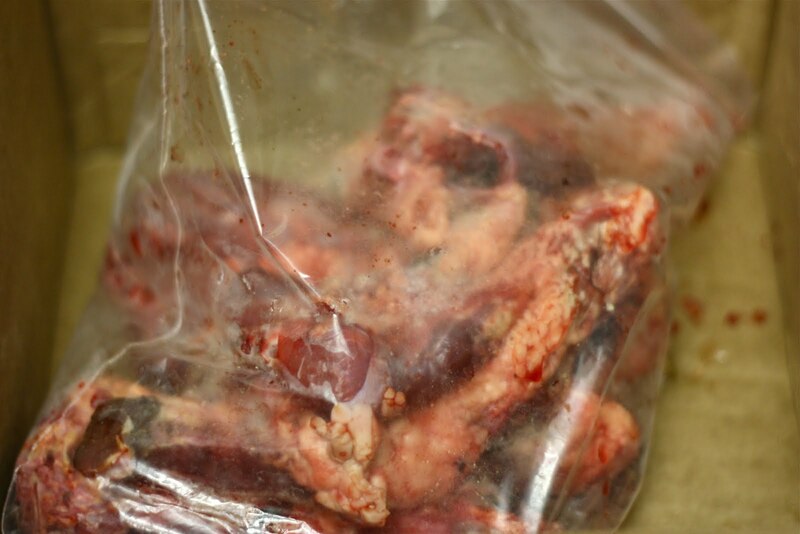 The tails are in a big ziplock bag with about 7 pieces of ostrich tail in it. Right when I opened the bag the pups came running into the kitchen sniffing out the new raw item on their menu. Needless to say they were excited and trying to jump all over me trying to figure out what I'm attempting to take out of the bag. I carefully took one out, probably with a look of disgust on my face, something about tails didn't sit right with me, but I knew the ostrich tail would make a great RMB for the pups. Sucked it up and put it on the cutting board to snap a picture of the pup's treat that evening. I mean, how often do dogs get to eat an ostrich tail? The first piece I grabbed is one of the smaller pieces in the bag. It is about 1 1/2 inches in width (at the widest part of the tail) and about 4 inches in length. A pretty decent size and definitely not a choking hazard. Even though I have been feeding raw for quite some time now, each time I give them something new I am a bit cautious, especially when it is a bone item. I wan to make sure they are able to gnaw and chew on the bone without hurting themselves. I usually do not have a problem with Mika since she chews her food and doesn't swallow or gulp down her food (unless she gets a boneless meal). 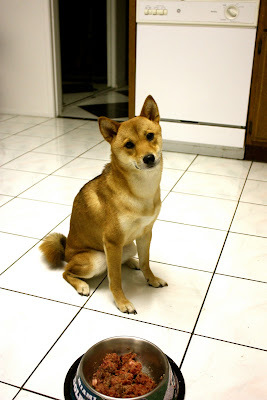 Kyuubi, on the other hand, will try to swallow things sometimes so I have to be careful with him. I was glad the pieces were big enough that I did not have to worry so much about him trying to gulp the entire tail. First pup to try the ostrich tail was Kyuubi. 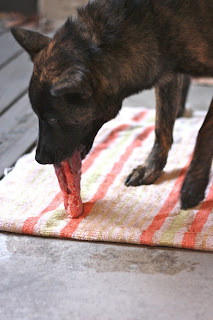 I laid their raw towel out on the patio and put the ostrich tail down on it. He immediately jumped onto the towel and sniffed out the ostrich tail. A few licks and then he started to try to chew the meat off the bone. 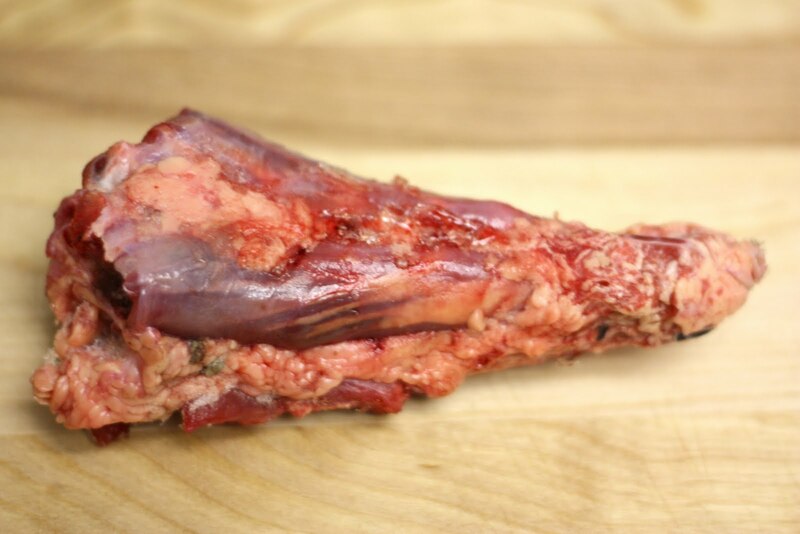 He doesn't like using his paws so it was a bit difficult for him to rip the meat off the bone. 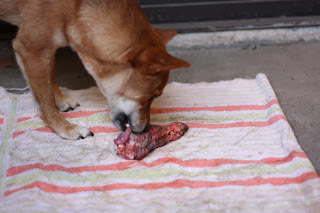 He slowly started to chew the bone with the meat attached. He was happy when I came up and held the ostrich tail for him to chew on. He had the most satisfied look on his face while crunching away at the tail. 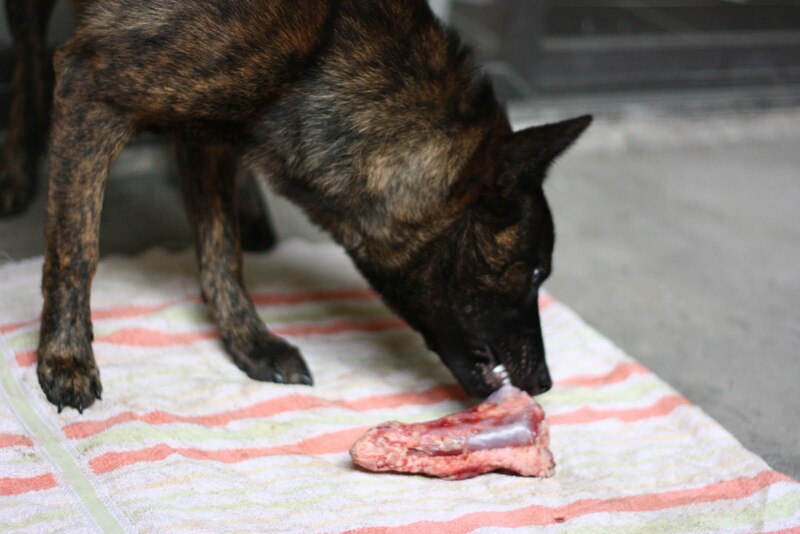 He got a good chunk of the bone off and so I rotated the tail to a meatier side so he could get some of the meat. 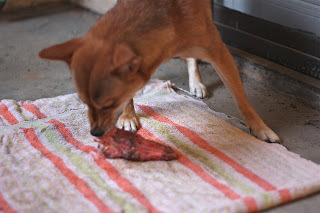 He ripped off pieces of the meat with his teeth and it helped a little since I was tugging on it a bit when he was getting a grip on the meat. Since this was a new item I did not let him eat very much of it. I wanted to make sure he would digest the tail perfectly fine before feeding him an entire tail as a bone-in meal. He did just fine with the ostrich tail and will probably get it later on this week as an evening meal. The tail is quite boney and I would most need to give him an organ meal in the morning before hand. Now it's Mika's turn. I figured she would do just fine with the ostrich tail since she's been on a raw diet for almost a year now. She does what she usually does when she gets a RMB. She sits excitedly waiting for me to put it down for her. After putting it down and giving her the "ok" to go for it, she slowly walks up to it, sniffing the ostrich tail. Slowly, she starts to lick it, trying to figure out if she really wants to snack on it. She also doesn't like to use her paws on RMBs so after a while I come save the day again and hold the ostrich tail for her. She immediately opens her mouth and gets the tail in between her molars. She knows exactly what to do when wanting and needing to crunch up bone pieces. I felt more comfortable with her eating the tail than I did when Kyuubi was eating it. She chews the bones thoroughly before swallowing it. Mika has always been good about eating bones and has never thrown up any of the RMBs she's eaten. After a while I remove the ostrich tail and put it back into it's ziplock bag with the other tails. Unfortunately, Mika scared me a bit after eating the ostrich tail. She was hacking a bit 30 minutes after eating some of it. This is the first time she has showed signs of wanting and needing to throw up after having something bone-in. Kyuubi's rating of the ostrich tail? Best RMB he's had to date! He is tired of the boring chicken cuts and the pork neck. Mika's rating of the ostrich tail? Loved it, but probably won't be having it very often. I will try it again with her to see if she can handle it better than she did the other night. As for me, I will probably purchase ostrich tails again when I run out. Kyuubi did very well with them. It's also another protein that they get that is different from the normal cuts that I can easily get at the supermarket. Oh, another plus? It's only $.60/lb. Yeah, I'll definitely be getting these again in the future! My heart is aching for poor Wrinkles. Wrinkles is a 12 week old Chinese Shar-Pei that my BIL's brother(s) (he has too many brothers so this entry might get confusing) had bought. He is the cutest little thing with all his wrinkles (hence the name Wrinkles). When I first saw him, I noticed that his left eye wasn't opened. He couldn't see out of his life eye very well and had felt very uncomfortable when he first was introduced to Mika and Kyuubi. I saw how run and hide so I put Mika and Kyuubi in my office and went out to give Wrinkles some treats. I heard that he wasn't eating much so I wanted to see if he would take some Stella & Chewy's freeze dried patties from me. At first he wouldn't take it from my hand so I put pieces on the ground, and slowly he started eating it. Slowly, but surely he started taking the treats from me. After an hour or so we reintroduced the dogs one at a time to Wrinkles. He and Kyuubi hit it off very well (there's a video of them playing together in my last post). Amy, who is taking care of Wrinkles, is my BIL's younger brother's (not the brother who purchased Wrinkles) girlfriend, and they have taken on the responsibility of caring for him although they did not purchase him. They are both very new at raising a puppy and were pretty scared that his left eye was completely shut and having puss form around it. I scheduled a vet appointment for them yesterday afternoon to get him checked out since Wrinkles did not have his first vet appointment yet. I was intending on staying at work, but Amy was going to go alone to the vet and was a bit scared. She asked me to accompany her and so I went with her and Wrinkles to the vet. 12 weeks, weighing in at 20 lbs! He was such a good boy when being handled by the vet tech. Even got his nails trimmed without a struggle. Only problem was, they couldn't see his eye. They took him to the back and put some numbing medication on his eye to see if they could open it and take a look. Turns out his eyelid was curled all the way down. Poor guy has entropion! The vet told us that he has a very severe case of entropion and referred us to an ophthalmologist. Amy wasn't expecting to care for a dog anytime soon, especially one she did not research and want herself. She is now caring for a dog that someone else purchased because they do not know how to care for him or take time off from their lives to feed him, play with him, put the drops needed in his eye. I am just upset at the irresponsibility that I witnessed these past few days with Wrinkles. I am glad that Amy has stepped up to help take care of him, but she shouldn't have to. Before taking Wrinkles home, my BIL's brother had asked the breeder about his eye. The breeder shrugged it off and said it will go away. I told them they need to contact the breeder and let them know what is going on with Wrinkles. I read through the contract that was sent with Wrinkles. Funny thing is, there's a spot for the "seller" to sign, yet no signature. There isn't even a number to call and contact the breeder. Only way to contact is via e-mail. I hope they can get things settled with the breeder. This morning Wrinkles was brought to the ophthalmologist. They didn't do the corrective surgery, given he is very young, they didn't feel like it was needed at such a young age. However, they did put him under and pulled his eyelids back out and stapled them. They are hoping that he will eventually grow into them and that having the staples out will get rid of his infection and he won't need the corrective surgery in the future. The staples will stay in for they are hoping 2 weeks, however the ophthalmologist said there's a chance he will need to have the staples in for a few months. The poor guy is only 13 weeks old and is already in so much pain. He is going to lose out on the important socialization window. I wish there was more I could do to help, but I can only keep trying to spread the word about researching breeds that one may be interested in and then researching breeders. It is so important to find a breeder that will be there 24/7 for support. Sister's brother in laws recently purchased a Shar-Pei puppy. He is the cutest little thing ever! He will be joining Mika and Kyuubi at work from now on too! They have a new playmate while at the office! 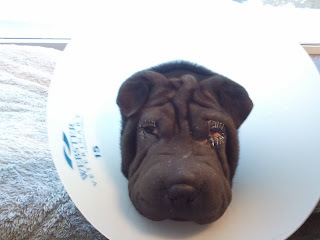 Here's a video of Kyuubi and Wrinkles, the Shar-Pei puppy! Last Sunday I took the pups with me to have a mini meetup with Corina, Jesse, Joey and their pups. It was almost a farewell meetup for Shuran who will be placed for a month with another family to see how he does. If everything goes well he will be placed with them as a co-op home to Corina's breeding program. It was very last minute as we had no idea where we were going to meetup at until an hour before. I had never taken the dogs to the dog beach before so I wasn't sure what to expect since it is not closed off. Kyuubi did very well off leash. Except for the part of jumping all over people who were trying to tan. Oh well, maybe that will let people know that they shouldn't be laying out in the sun at the dog area for the beach. 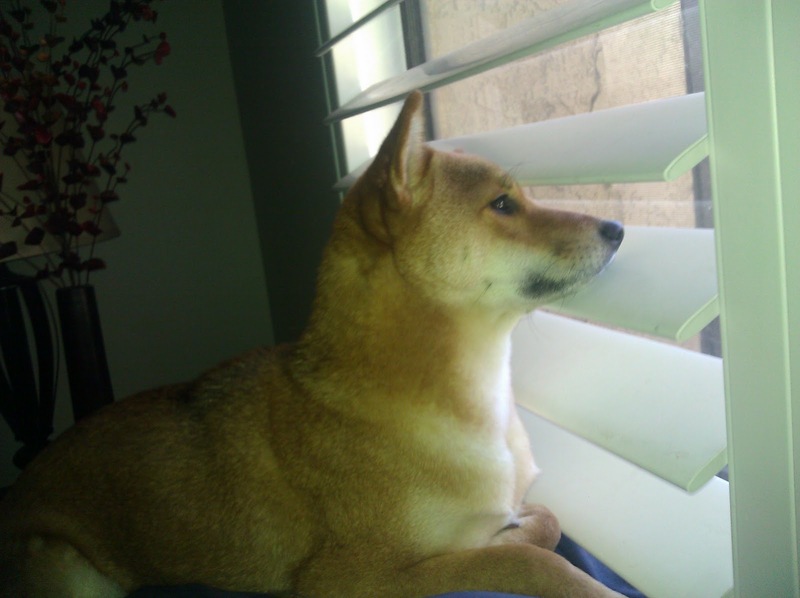 Kyuubi went off for a bit on his own and came back to find us. I was proud of him, but at the same time I think I was having some anxiety wondering if he would make his way back. We did keep an eye on him from a distance. Around 10 weeks old Kyuubi tried to jump into a little river flowing through the complex where Kevin's mom lives. He did get wet, and seemed to want to keep going in the water. However, at the beach, he was terrified of the water. Someone had mention it might be because that the water was actually coming towards him and he might not have liked that. Mika, too was afraid of the water, but ended up getting wet because she wanted to dig in the wet sand and chase other dogs who were fetching balls out of the ocean. The pups had fun and got to hang out with their buddies. I want to continue taking them to the dog beach, but I can do without the sand, so I think we'll just stick to dog parks for now.